Last night, I chomped away merrily on my pre-bedtime snack of a bowl of Special K fruit something or other. I chomped down incredibly, not-so-merrily, hard upon my tongue. You know how you usually take a few seconds to recover and then the pain subsides as blood fills your mouth? Thirty seconds later, I still could not concentrate on anything except the pain. Agony. I couldn't swallow, didn't want to swallow for fear of what might be there. I cannot recall ever biting my tongue with such vigor or hearing that particular crunch noise. As soon as I could breathe again, I gingerly opened my mouth to look in the bathroom mirror. No blood. But a ginormous blood blister reared its ugly globuleness at me. This morning I can hardly chew. I think I would rather have the little nip/cut bite than this bruisey, blistery throbby business. And seriously, your tongue is in your mouth all the time. How do we magically just chomp on it sometimes? Are we that clutzy? Any of you have awesome "bite your tongue" stories? 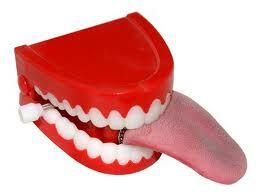 Sorry, no biting my own tongue stories but I did give myself a forked tongue. As a kid, I liked to lick the butter knife and managed to split my tongue down the middle. The split is still there, 20 yrs later! I also hooked a red and white fish floater in my tongue. My poor grandma was baby-sitting me and had to take me to the hospital to get it out.